2013? No, those words are from the 2000-2009 discussions on the future of Larison’s Turkey Farm site. We are hearing the same words in the current discussion about the future of the Turkey Farm. We may disagree about the future of Larison’s Turkey Farm, but we shouldn’t disagree about its recent past. In 2010 Chester Library had the Chester Historical Society’s collection of Observer Tribunes from 1950 to 2009 scanned into a database. Using that database I searched for articles about the Larison’s Turkey Farm property. Here are the relevant articles I found since 2000. I tabulate the date, the author, the headline, and excerpts from the news article. There is more to a story than the headline so reading the excerpt is helpful. I hope that we can learn from past events and debates and apply insights and observations to current decision making. Article Titled "Historic turkey farm may be developed"
“Larison's Turkey Farm Inn, a landmark at the intersection of Route 206 and Route 24 since the 1940s, might fall under a developer's wrecking ball. Click here to access 30 additional excerpts from the Observer Tribune related to Larison's Turkey Farm and its history. 1800 Isaac Corwin builds a farmhouse on the site he bought from Benjamin Luse. 1829 James Topping buys the farm from Isaac Corwin. 1873 Sunnyside House is built by James Topping for his widowed daughter in law. 1929 New Route 206 is built and cuts through the eastern part of the property. 1939 Historic American Buildings Survey shows Leila (Eliza L.) Topping as owner. See photos, plans, and notes at http://www.loc.gov/pictures/collection/hh/item/nj0643/ . 1945 Willis Larison buys the Topping Farm and converts the house to an inn/restaurant. 1974 Arthur McGreevy buys Larison’s Turkey Farm from Willis Larison. 2000 Arthur McGreevy contracts to sell the Turkey Farm to Site Development Inc. of Cherry Hill who plans to move or raze the Inn and build a CVS pharmacy and bank. 2000 Public outcry ensues over plans. Planning Board holds informal hearings. 2001 Larison’s Turkey Farm Inn closes. District to cover the site. Wachtel and neighboring landowners sue, but the suit is set aside in Morris Superior Court. Possible plans to convert the Inn to a town hall and build a bank and pharmacy on another part of the site were discussed with Wachtel. 2002 Arthur McGreevy sells the property to Harold Wachtel. 2002 Lou Mont reopens Larison’s Turkey Farm Inn. 2005 Bocina Co. of Basking Ridge, a developer selected by Wachtel, presented plans for an upscale hotel, stores, and townhouses. A new sewer plant would be required. 2005 Larison’s Turkey Farm Inn closes again. 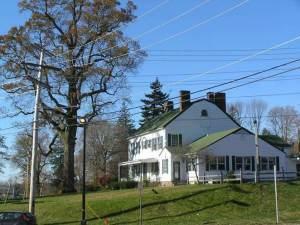 2007 Puddingstone Inn is opened by Theresa Gaffney (Sally Lunn’s Tea Room owner). 2007 44 acres in the rear of Larison’s tract is purchased from Harold Wachtel for $3.74M for open space, creating Larison Woods. 2008 Larison’s Steakhouse is opened by Joseph Lobrano (Publick House owner).